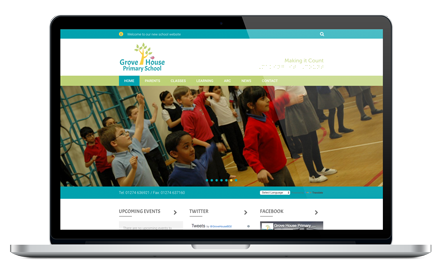 Our creative team of web designers are committed to providing you with a beautifully designed and user-friendly website to show off your school and encourage parent engagement. 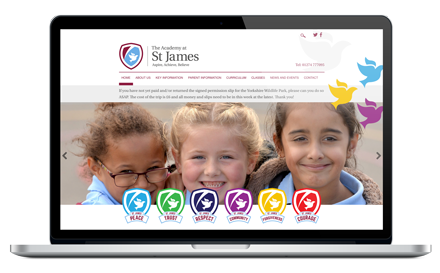 We know how important it is that your website demonstrates your school aims and values and that it also meets Ofsted requirements - we can help with this too. All of our websites are designed from scratch by your very own dedicated designer and we can offer packages suited to any budget. Every design we do is tailored to your school, our designers will find out as much as they can about your school before they start on any work, to ensure what they create represents your school. We know that more and more users are accessing websites on their mobiles and tablets rather than their laptops and we recognise the importance of websites being easy to use on such devices. Our websites are built using a CMS to allow you to easily update the content on your website. It's highly flexible and purposefully built to give you as much control as possible. We'll even provide training. We provide website hosting and domain names so you can be sure you've got a highly reliable service and everything is taken care of for you, including backups and necessary updates. Once you've got your new website, you'll want it to show up in search results so that people can find you! We will build your website with this in mind using the best practices and clean website code. We take accessibility and usability into consideration as standard with all our websites to ensure your website is usable by everyone, irrespective of their abilities or device they are using. Display upcoming dates on a calendar for your parents, pupils and staff. Easily organised with different categories and even the facility to display different calendars for each category. With more and more languages being spoken in the UK, it's important that your website caters for all. A translation facility is included to translate your website at the click of a button. Updating a website can be a daunting task for some staff, but for peace of mind there's inbuilt version control, meaning any previously saved version of a page can be reverted back to. 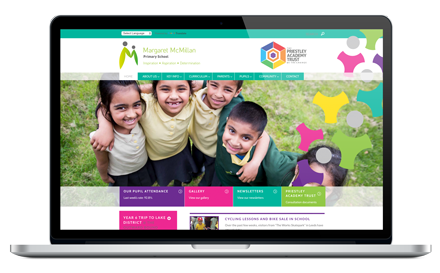 Encourage engagement with parents, pupils and the community with comments on your site. Ensure a safe environment by moderating every comment. Getting the content added to your new website whether you're starting from scratch or copying from your old website can be a huge task, we'll take care of this for you. Take the hassle out of adding new content and be super organised by scheduling content to be published on a date in the future. No need to set those calendar reminders! Use our separate blogging tool, PrimaryBlogger or fully integrate into your website, the choice is yours! Keep your parents up to date with what's happening in school. Flexible menus with an unlimited amount of pages and the ability to add pages wherever you would like them to appear in your website menu. Completely in your control. Make your school website even better and more interesting by easily adding videos to your site, simply copy the embed code from the likes of YouTube and paste it in. It couldn't be simpler! Easily display single images or full galleries to show parents what's been happening in school. You can upload multiple images at once and there is automatic file size optimisation in place. Create as many website users as you want and assign them different roles and capabilities. Limit a user so that they can write content but ensure an administrator has to approve. Useful for staff only areas, governors or even Ofsted. Put content in here for certain users and give them login details to access it, shared or per-user login credentials. Ofsted inspect your school website before they visit, so it's vitally important that it's up to scratch. We're on hand to get the right information on your website. Use Facebook or Twiiter to inform parents on school information? If so, your website can link to your accounts or your posts or tweets can even be embedded within your website. Want to know how many people are visiting your website? Or what content they are looking at? This free Google service can be set up for you to measure your website's performance. Allow your website users to easily get in touch via a simple online form and make it easy for them to find you by displaying your location on a Google Map. Anti-spam is set up on all forms.